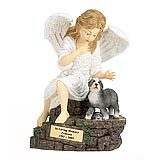 "Oh my goodness, I am so sorry that I did not confirm with you, It is the most beautiful memorial I have ever seen and everyone is raving about it. 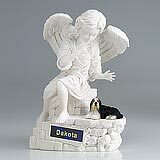 I was going to write you in the near future to see if you wanted us to put your link on our website, I would be honored to promote such a beautiful piece. 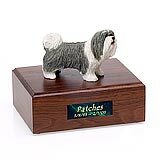 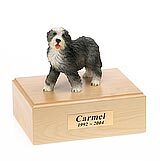 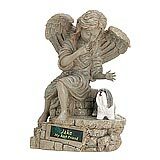 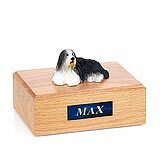 www.carolines-kids.org Thank you for offering so special a memorial for our furkids, and for the wonderful service, "
All available Bearded Collie dog urns and memorials will be displayed with the figurine on the Bearded Collie urn you select and in the appropriate size.